See the OP for attaching vintage Harmon Kardon M6351 speakers to the Lepai amp. The speakers have a nice appearance, great full range sound and inexpensive used with the robust Harmon Kardon reputation. Due to the proprietary Apple G4 plug, the speakers are inexpensive used. An easy mod by stripping the speaker wires to fit regular amps. I own all three amps reviewed here as well as three sets of the Apple speakers. All three amps were tested with the same M6351 speakers. The original Lepai 220+ Tripath amp which used to sell for twenty bucks is no longer in production and more pricey now as used. Checking the Amazon site confirms that the Lepy LP-2020A-3A Yamaha chip is an alternate replacement for the out of production Lepai LP-220A+. There is also the newest Lepai LP-220TI adding to the confusion; note that there are also a few other Lepai amps in the series as well. The original 220A+ has very loud sound! All have the blue power on light up LED around the volume knob. The tests below are with the "crystal" Harmon Kardon M6351 Apple G4 speakers. There is a revolution happening in audio. The days of heavy, hot, power-sucking audio amplification are fast passing, replaced by an era of a new type of digital audio amplifier, the “T” amp. These amplifiers are over 80 percent efficient, are cheap and best of all, sound great. They are available in board form now at places such as eBay, Amazon, Parts Express and MCM Electronics. What is a “T” amp? The T comes from a company called Tripath Technology Inc. named after its CEO, Adya S. Tripathi. This was the first company to make the integrated circuits that comprise these amplifiers. Their first IC was the Tripath TA-2020, a 20-watt-per-channel amplifier chip. These were used in very small battery-powered audio amplifiers (one in particular by a company called Sonic Impact) and sold in places like The Sharper Image for around $30. T-amp ICs were originally designed to be used inside HDTV receivers because of their small size, low heat, high power and high efficiency. The word quickly went around — these cheap little plastic amplifiers with the big, round volume control outperformed some audiophile amplifiers that were selling for over 10 times their cost. People were even hauling 12-volt car batteries into their living rooms to power these little amplifiers. I had one of the early Sonic Impact amplifiers and found that with the right high-efficiency speakers, it truly sounded magical. Tripath began making bigger amp chips, but the cat was out of the bag. Soon lots of IC companies were manufacturing digital amp chips, and since Tripath could not compete with the likes of Texas Instruments and the Asian IC manufacturers, it merged with a company called Etelos in 2008, which itself went out of business in 2013. Comparing each of the amps each hooked up to the same M6351 speakers, the Lepy is not as loud as the original Lepai 220+. One of the issues of the original Lepai 220+ when hooked up to the PC sound card line out; it is loud, too loud causing distortion when cranked all the way up. Turning down the volume control on the desktop helps get around this issue for better volume level control on the Lepai 220+. In hooking up the Lepy, the total volume is not as loud allowing better control range of the volume. Setting the control panel volume to maximum allows the Lepy volume knob to be set half way for regular volume and all the way up for blasting sound. Not ear splitting, but enough to drown out a nearby TV turned on. The newest Lepai TI is right in the middle of volume attenuation between the other two amps. On the sound card line out the control panel can be set to two thirds and still get loud volume out of the TI model. I first plugged in the new Lepy amp with the M6351 speakers into my laptop. It is an improvement and louder then the laptop "tinny" speakers. However, it was not anywhere as loud as the Lepai 220+ amp on the desktop due to plugged in the headphone jack. Swapping amps; the Lepai 220+ plugged into the headphone jack is definitely much louder; again very loud when the control panel volume is maxed out. The newest Lepai TI plugged in the headphone output works well with a compromised mid volume level. The control panel can be set to maximum resulting with the TI model achieving similar loudness of the original Lepai 220+ though the original is still the loudest. The Lepai LP-220A+ amplifier's TA2020 amp chip incorporates Tripath's proprietary Class-T Digital Power Processing technology. This chip was cited by the engineering magazine IEEE Spectrum as one of the "25 microchips that shook the world" when it was introduced in 1998. No wonder Tripath amplifiers have earned a reputation for sound quality from budget-minded audiophiles, and the LP-2020A+'s rich tonal balance won't tarnish that impression. There’s a subset of audiophiles who insist that vacuum tube–based amplifiers produce the best sound and always will. So, when some in the audio community claimed that an amp based solely on semiconductors delivered sound as warm and vibrant as tube amps, it was a big deal. The amp in question was a class-D amp concocted by a Silicon Valley company called Tripath Technology. Class-⁠D amps work by not trying to amplify the incoming analog audio signal directly, but instead they first convert it into a train of digital pulses that can be used to switch power transistors on and off. The resulting signal is converted back into an analog signal with a higher amplitude. Tripath’s trick was to use a 50-megahertz sampling system to drive the amplifier. The company boasted that its TA2020 performed better and cost much less than any comparable solid-state amp. Like most class-D amps, the 2020 was very power efficient; it didn’t require a heat sink and could use a compact package. Tripath’s low-end, 15-watt version of the TA2020 sold for US $3 and was used in boom boxes and ministereos. Other versions—the most powerful had a 1,000-W output—were used in home theaters, high-end audio systems, and TV sets by Sony, Sharp, Toshiba, and others. Eventually, the big semiconductor companies caught up, creating similar chips and sending Tripath into oblivion. Its chips, however, developed a devoted cult following. Audio-amp kits and products based on the TA2020 and its sister chips are still available from such companies as Sure Electronics, and Audiophonics. I own both. The Lepy needs more input level to get the same level of output as the Lepai. The Lepy input is attenuated more than the Lepai. IMO, the Lepy sounds better than the Lepai. Standardized line levels can cause the Lepai to go into distortion easily at high volume. Not so with the Lepy. I believe the "+" on the Lepai is a notice for the upgrade of the anti-pop relay. PCBONEZ wrote: I was digging for detailed specs when I found this post. My take is the "+" indicates it's an actual Tripath chip. The "+" models all say "Class-T" and the rest say "Class-D". IIRC Class-T = Tripath only as it's a Trademark thing. The Lepai 2020A+ is the Tripath chip. The Lepai 2024A+ is also a Tripath chip but it appears to be a 'lesser' chip than the 2020A+. In WRITTEN specs: 2020A+ @ 2x20w / 2024A+ @ 2x15w. Lepai, Lepy and Lvpin are apparently all the SAME company with Lepy being the newest name. They are ALL "Chinese Junk" as Bare says. Based on Youtube videos that open them up and look at PCB level they often use salvaged parts. Thus difference from one unit to another has nothing to do with the name stamped on it, it is more dependent on where they got their parts that week. Sounds like I'm talking them down. - NOT! For the cost these are great little amps. Just be advised that it's good idea to check the board and recap and/or resolder if needed. On paper the 2020TI (Texas Instruments Chip) is best but until some 3rd party reviews on it come out, the 2020A+ is probably the best choice and the 2020A second. Unfortunately the original Lepai is no longer manufactured with its historic Tripath chip. Unusual that the series have different names such as Lepai and Lepy; yet all the amps look identical alluding to some as possible bootlegs? I really like the original Lepai LP-220A+ due to how loud it is. The newest Lepai TI utilizes a Texas Instruments chip inside which alludes as not the same quality of sound chip as the Yamaha or the reputation of the Tripath amps. However, Texas Instruments do have a long history in calculators, home computer, commercial components and of course the vintage Speak and Spell. Decades of experience in sound chips, the TI TPA3118 amp chip is used. The famous Tripath TA2020 amp chip gives the Lepai LP-2020A+ its heart and soul, providing the listener with Class AB precision and warmth while maintaining the efficiency of a Class D amplifier. Unfortunately, the Tripath TA2020 is an endangered species ever since the Tripath company was purchased by Cirrus Logic in 2007. The scarcity of this amplifier chip is especially troubling given that it was listed by IEEE Spectrum Magazine as one of the 25 microchips that shook the world. Tasked with the challenge to develop a successor to the LP-2020A+, Lepai engineers knew they had to design an amp that combined efficiency, sound quality, and value — and they did it. Focusing their design around the Texas Instruments TPA3118 amp chip, they created the LP-2020TI. This new amplifier from Lepai, though it contains no legacy amplifier chips, overcomes its predecessor in both flexibility and performance. The hook for me in the Lepai TI was reading reviews on the better Signal to Noise ratio. The TI is definitely louder then the Lepy. The original Lepai 220A+ is still the loudest of the three. Due to the "middle volume" attenuation of the TI compared to the other two amps, I could not hear any hiss when the Lepai TI amp is kicked up to full blast, a very solid replacement of the Lepai A+. The best though maybe too loud resulting in distortion when cranked up. Great for low input signals such as headphone jack. Ideal for a sound card or any source that has a strong signal. Too quiet to fully amplify when using a headphone jack such as in a laptop. The newest Lepai model, a great compromise of signal noise ratio vs loudness. Great for both sound card line out and headphones. My preference is still the original Lepai LP-2020A+. Since it is no longer manufactured and now getting pricey, the Lepai LP-2020TI is a great alternate. Even though not as loud, it is better matched for use as a desktop sound card line out or a laptop headphone jack. I would only buy the Lepy LP-220A-3A if hooked up to a sound card line out; a headphone jack is too quiet even when the Windows volume is maxed out. Since the sound card line out has less initial attenuation, I moved the Lepy amp over to the desktop. The Lepai TI is my laptop amp due to only a headphone output. I'm saving the original out of production Lepai 220+ for any future more attenuated device such as a portable CD or MP3 Player with headphone jack. Last edited by CRTGAMER on Sat Aug 26, 2017 4:12 pm, edited 37 times in total. It occurs to me that you probably do not want your PC boosted to 100% volume. You probably want to find a volume level between 50% and 70% that outputs enough audio to support the amplifier but doesn't introduce distortion from the mediocre grade amplification and potential signal interference often associated with motherboard audio. marurun wrote: It occurs to me that you probably do not want your PC boosted to 100% volume. You probably want to find a volume level between 50% and 70% that outputs enough audio to support the amplifier but doesn't introduce distortion from the mediocre grade amplification and potential signal interference often associated with motherboard audio. I think you misunderstood my review or I did not word it clearly. The distortion was on the older Lepai amp when the PC colume control set all the way up which simply resulted in the amp kicking too loud. On the newer Lepy amp, the PC control panel volume has to be set to max to allow decent sound levels. There is no distortion on the newer amp due to over attenuation built in. On my laptop lower signal headphone feed, the control panel volume is set to maximum for the older Lepai amp. No issue of distortion, a nice increase in volume vs the newer Lepy amp which is too quiet thru the laptop headphone jack. My preference is the older Lepai 220A+ with the Tripath chip due to the increased rich volume capability. I just ordered the newer Lepai with Texas Instruments chip, will update the review above when it comes in. The great sounding small Lepai amps especially when matched to decent speakers are not meant as the home stereo system; are compact ideal for the desktop and laptop at home arrangement. Last edited by CRTGAMER on Tue Aug 15, 2017 2:50 pm, edited 1 time in total. Oh, I'm just speaking broadly. Most PC on-board audio doesn't use high-quality amplification or good signal isolation, meaning when you turn the volume up to 100% on most PCs (and especially laptops) you can introduce distortion and electrical noise and interference into the signal going from the PC to an external amplifier/speaker. It is always better to try to pair your computer with an amplifier or amplified speakers that have adequate power to accept a 50%-70% signal from the PC. By not pushing the PC audio to 100% you can often reduce the impact of any distortion or noise coming from the PC end. If you need to push the PC volume up to 100% to get adequate volume from your amplifier and speakers, you probably need a more powerful amplifier. Actual PC volume control to 100% shouldn't tend to be an issue. Not saying it can't ever be, but I haven't seen it be an issue recently. You can get noise on the signal regardless, since the inside of a PC is a "noisy" environment, which is why digital connections (or USB DACs) are often preferable. Where I have seen consistent problems is using things like VLC's volume control to go past "100%", which sounds like garbage regardless of connection. 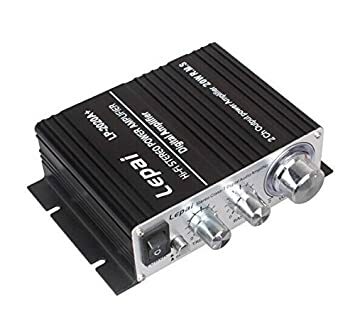 I have a Lepai T-Amp somewhere, probably the same as the older one tested here, and I can confirm that it does distort at mid/high volume levels. I've seen suggestions that a beefier power supply can alleviate it somewhat, but I think it's partly just a limitation of the technology. At low power use via small speakers and/or low volume, they work well, but they tend to run out of steam if you crank things up. Updated the review at the top, three generations of the Lepai/Lepy amps reviewed and compared. I included additional links, noteworthy is the video review. marurun wrote: If you need to push the PC volume up to 100% to get adequate volume from your amplifier and speakers, you probably need a more powerful amplifier. isiolia wrote: Actual PC volume control to 100% shouldn't tend to be an issue. Not saying it can't ever be, but I haven't seen it be an issue recently. You can get noise on the signal regardless, since the inside of a PC is a "noisy" environment, which is why digital connections (or USB DACs) are often preferable. Both my Desktop and Laptop control panel volume maxed out produce no sound distortion. The only distortion would be at the external amps only when kicked up all the way; control panel volume full or not. Agree, best to have everything not peaked out. Just that the low level "think preamp" volume of the sound card are not as critical as high level at the amp output speaker side. Concur with the original Lepai "running out of steam" as too loud when volume maxed out; but this due to the under attenuation resulting in over amplification limit. The solution is to reduce the control panel volume to match to the amp SNR level. 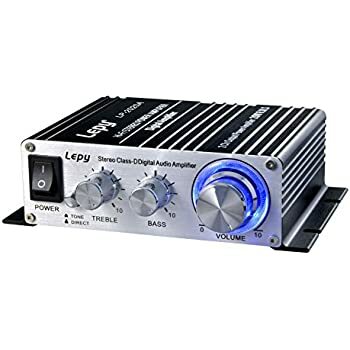 The compact Lepy Amps will not compete with say a full blown home theater system, they are better suited as a PC amp speaker system or as bedroom space saving stereo amp. I swapped the 2 amp and the 3 amp power supplies on each Lepai; sound clip distortion still occurred when cranked all the way up. However these all were done with the compact Apple G4 speakers which thunder loud, but are not window breakers. I imagine the original Lepai Tripath amp which is the loudest will perform even better when matched to the heavier 3 amp power supply and attached to full sized stereo speakers. CRTGAMER wrote: Concur with the original Lepai "running out of steam" as too loud when volume maxed out; but this due to the under attenuation resulting in over amplification limit. The solution is to reduce the control panel volume to match to the amp SNR level. The compact Lepy Amps will not compete with say a full blown home theater system, they are better suited as a PC amp speaker system or as bedroom space saving stereo amp. My take was similar, though I think it depends on what you're driving. For relatively easy to drive stuff like your Apple speakers, or maybe some small full range driver in an arcade cabinet or something a T-Amp is great. For me, it would have been for computer audio, but since I was trying to use it for bookshelf speakers, it didn't really hold up to the basic 50W/ch stereo amp I was using (Audiosource Amp 100).